"But (what) we have to say of the God whom we profess in Christ: that he is exactly where we are, and only there is He to be found." trust and mutuality. This has the power to change all relationships . . ."
The dance itself . . . "
"Because the Christian God is not a lonely God, but rather a communion of three persons, faith leads human beings into the divine communion. One cannot, however, have a self-enclosed communion with the triune God - a 'foursome,' as it were - for the Christian God is not a private deity. Communion with this God is at once also communion with those others who have entrusted themselves in faith to the same God. Hence one and the same act of faith places a person into a new relationship both with God and with all others who stand in communion with God." about it - there was room at this table for a fourth. "Note the hand of the Spirit pointing toward the open and fourth place at the table! 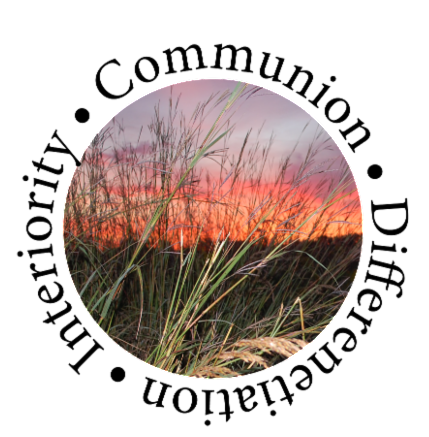 Is the Holy Spirit inviting, offering, and clearing space? 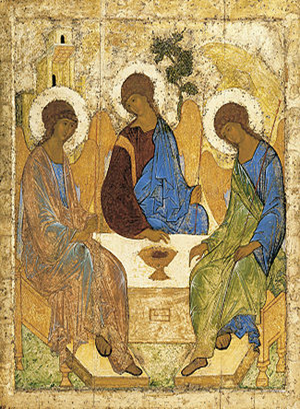 "In the icon of the Trinity, the Holy One is in the form of Three -- eating and drinking, in infinite hospitality and utter enjoyment between themselves. The Trinity seriously, we have to say, "In the beginning was the Relationship." Why a Day of Communion? Since the early 1990s our community has chosen the last day of each month to reflect on our communion with each other, with the mystical Body of Christ, with all humanity, with our planet sister Mother Earth, and with the universe. According to Thomas Berry and others "communion" is one of the three principles that govern the universe. The other two are"differentiation" (diversity) and "interiority" (subjectivity). To learn more about these principles, click HERE.